Greetings from the print lab at Edinboro University, in lovely Edinboro, PA! A couple of years ago I was invited by Egress Press, a printing house run by John Lysak (fine art faculty member at Edinboro) to make an etching. This year my husband was invited to make a couple of lithos, and they generously let me tag along to sneak in and use the etching lab again. 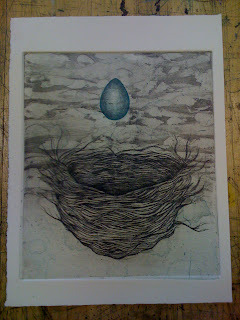 I just finished a new, two color, copper etching today of a robin's egg and nest. We've been staying with John and his wife Helen at their cozy home not far from the university. It's a lovely rural area nestled in a valley with a big waterway called French Creek running through it (currently flooding many of the roads! 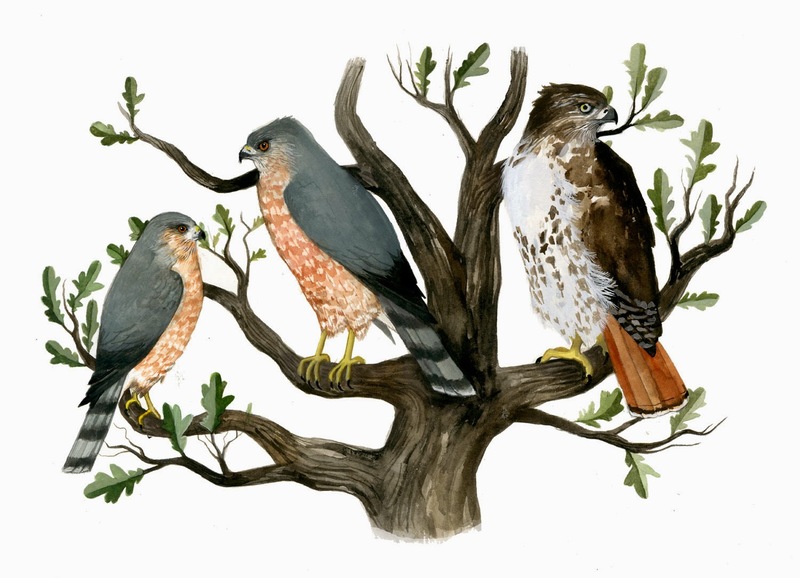 ), and it's supposedly one the most bio-diverse watersheds in PA. John and Helen have all sorts of beautiful artwork hanging in their home. One engraving hangs above their mantle. It's an old natural history print of an egg suspended above a nest. I've seen many of these prints before. Its composition purely serves a scientific need to show what type of egg goes with a specific nest. Like John, however, I've always been a bit mesmerized by how the eggs eerily levitate above their nests; there's something almost metaphysical about it. So, I decided to take a couple of old copper plates and etch my own version and homage to these images. 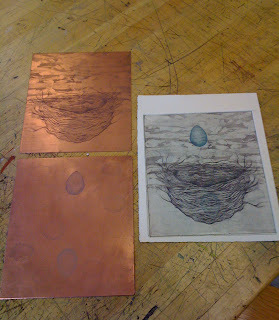 One photo shows a proof with the two copper plates (one plate has the blue egg etched on it, and the other the nest), and the other image is of a final proof. It's all ready to ink up and edition, and that's what I'll be spending the day doing tomorrow. Happiness! It's breathtaking Diana, I hope you made more for your Etsy shop :) It's always so inspiring to visit your blog. Oh wow. That's beautiful! 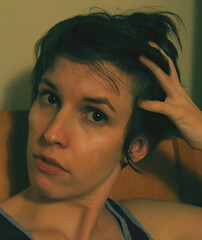 (I found your site through Sezio's interview.) Engravings are enchanting. Even though I understand the process, it still amazes me that an actual person can make such a thing, now, in the 21st century. It has such an esoteric atmosphere to it. Your work is gorgeous. It is so beautiful, I too hope you made some for your shop. How wonderful to "tag along" on such a trip. Thanks everybody! I'm still messing around with the plates here in PA, but hoping to have it ready to edition by the time I'm home. And when that happens, yes, there will be copies for the Etsy shop. ah! this is, well, i don't have words really. Very cool to see the process behind the end result! Another lovely work, Diana. I would like to add it to my collection. Could you let us know when it becomes available?